David Archambeau/Daily Mining Gazette Michigan Tech’s Angus Redmond has successfully filled the void in net left by Jamie Phillips. CINCINNATI — Coming into the 2016-17 season, the biggest question facing the No. 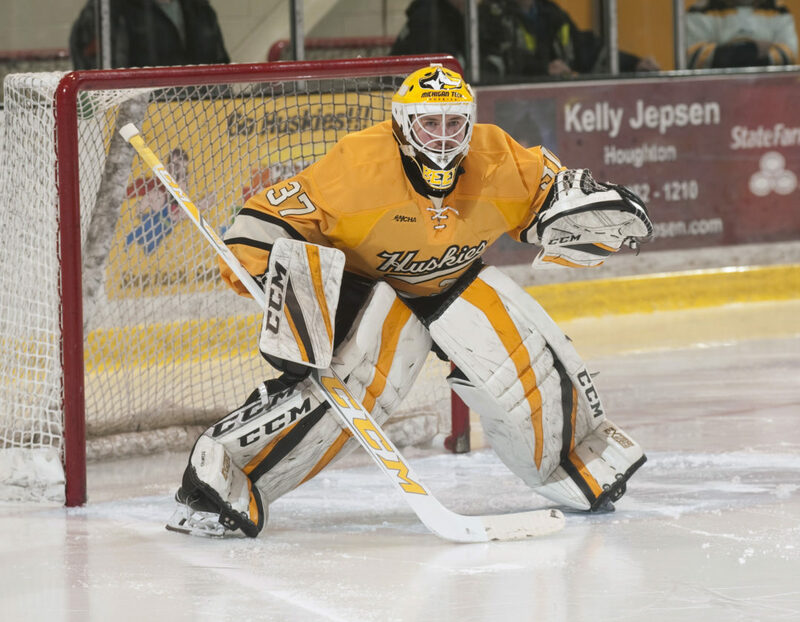 19 Michigan Tech Huskies was going to be who was going to step up to the mantle and replace Jamie Phillips in goal. The Huskies were returning two goaltenders who played very little over the past two seasons and a new freshman who could be a part of the future. The Huskies felt comfortable starting the season with senior Matt Wintjes and sophomore Devin Kero as a 1A and 1B situation while freshman Angus Redmond adjusted to the pacing of NCAA Division I hockey. Redmond needed the time to get up to speed, and coach Mel Pearson and his staff felt that the two veterans had earned the right to start the season. While neither Wintjes nor Kero had done enough to keep the other from getting the chance to start, the other issue was how long it was going to take Redmond to get up to speed. Redmond was given the chance to play a little over 12 minutes on Oct. 14 against Alabama-Huntsville. He surrendered two goals on just five shots and showed he was still not quite ready to go. The pressure to get him ready to go would not have increased if either Wintjes or Kero had been able to step in and earn the job themselves. 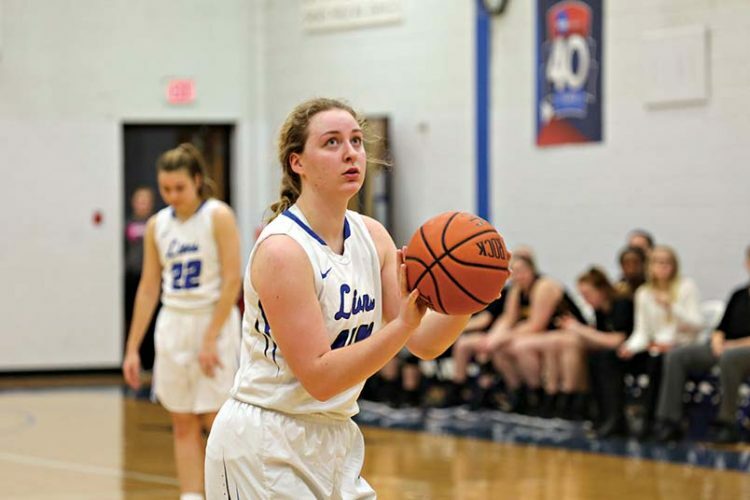 Instead, the Huskies opened the season 1-5-2 and were in danger of finding themselves too far out of the hunt before they even began to compete. 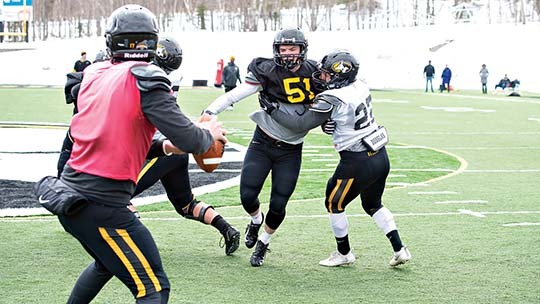 Needing to make a change of some sort, Pearson and his staff discussed ramping up Redmond’s development ahead of an Oct. 28 game at home against rival Northern Michigan. Redmond credited Shawhan and assistant coach Gary Shuchuk with getting him ready by giving him a challenge in practice that he could work towards. On that fateful Friday night, the Huskies also honored the last NCAA Championship in school history, putting more pressure on the shoulders of Redmond. Seeing just 19 shots in that game, Redmond earned his first career shutout as the team won just their second game of the season. He then won 11 of the next 14 games, earning his second career shutout in the opening game of the GLI against Michigan. Pearson was extremely pleased with how quickly Redmond shored up the Huskies’ goaltending as the team’s defensive play improved. January and February saw Redmond do some good things but also struggle somewhat. In eight times, he saw 20 or less shots, but only won three times in those eight contests. Another issue cropped up in his game where a long shot from the blue line against Northern Michigan found its way past him — and he was involved in a very bizarre game in the WCHA playoff opener against Lake Superior State. In a game where the Lakers pulled their starter, put him back in and ultimately pulled him again, Redmond started the game, gave up a third goal in the third period, was pulled and eventually went back into the net when Wintjes surrendered a goal on the first shot he faced. For Redmond, that 6-4 win over the Lakers was a turning point for him as he was able to refocus himself from there. Since that game, he has only surrendered five goals over the next five games as the Huskies eliminated the Lakers, the Mavericks and the Bowling Green State Falcons to earn the Broadmoor Trophy as WCHA Playoff Champion. He did face some more adversity last Saturday against the Falcons. With the Huskies up 2-0 in the third period, he surrendered a wrist shot in the slot. He then misplayed a puck shortly after leading to the tying goal 24 seconds later. Rather than sulk and limp to the end of the contest, he shut down everything the Falcons threw at him, giving the Huskies the time needed to win the game in second overtime. No. 1 Denver Pioneers coach Jim Montgomery has been as impressed with what he has seen of Redmond’s play as Huskies’ fans have been. However, Shawhan says the proof will be in how he plays next year. No matter what happens next season, Redmond has gone a long way already towards being a strong longterm replacement for Phillips.